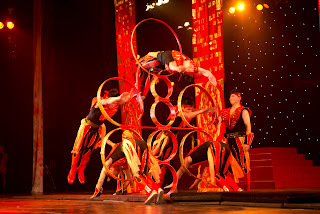 ...at the Cirque Shanghai this year. That's what I did this time, mouth wide open is how Chica saw the entire show and gasps of disbelief is what one heard several times among the audience as the Cirque Shanghai crew continued to amaze and live upto expectations they set last year and in fact go beyond as they defied all gravity and twisted and turned and flew and tumbled and juggled. I mean just look at the picture below and tell me how can one possibly balance all those chairs with a person next to every chair handing out her hand so casually for the next one as if asking for a cupcake to set on a plate. And then performing all kinds of handstands and other gymnastic moves on top of these chairs. 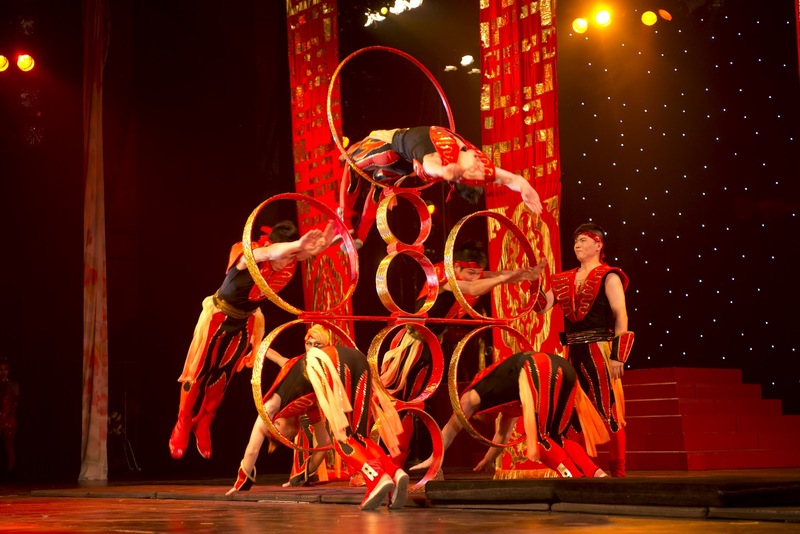 My kids felt another of the coolest acts was when these acrobats kept jumping and tumbling through these different hoops, one at a time at first, then in well co-ordinated two's and three's and finally bodies twisted together. Awesome and cool and wow is what was heard all the time! Very lively stage, dazzling costumes, an affable crew and the breathtaking acts - I recommend the Cirque Shanghai very very highly! • Wednesday at 2, 6 and 8 p.m.
• Thursday at 2 and 8 p.m.
• Friday at 2, 7 and 9 p.m.
• Saturday at 2, 6 and 8 p.m.
• Sunday at 2 and 4 p.m. The schedule on Wednesday, July 4 is 2 p.m., 5:30 p.m. and 7:30 p.m, since the Navy Pier fireworks will begin at 9 p.m.There will be additional performances Tuesday, July 3 at 2 p.m., 6 p.m. and 8 p.m., Sunday, Sept. 2 at 8 p.m. and Monday, Sept. 3 (Labor Day) at 2 p.m. and 4 p.m.
Tickets are $15.50 - $29.50 and are available by calling 800-745-3000 or visiting www.ticketmaster.com/shanghai. 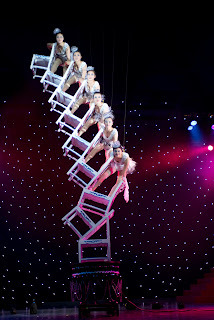 Discounted tickets for groups of 10 or more are available by calling GroupTix at 773.327.3778 or visiting www.grouptix.net. A Tip : With kids' summer vacation on, plan on going on a weekday if possible for considerably cheaper tickets! Lovely Neera, how is chicago treating you? How are the kids? I so miss Chicago when i see your posts. Have fun and loads of it. Great of an article, can let a person will have insight some life philosophy. Content is good rich logical, description with humor, let a person look at a comfortable happy. I’ll read again a few times, or let oneself know more. NOW is the time to vote to end Female Foeticide!